French President Francois Hollande Won't Seek Re-Election : The Two-Way This marks the first time in 60 years that a sitting French president hasn't sought re-election. Hollande is extremely unpopular, and this opens up the candidate field for his Socialist Party. French President Francois Hollande delivers a speech at a ceremony at the Elysee Presidential Palace in Paris on Thursday. 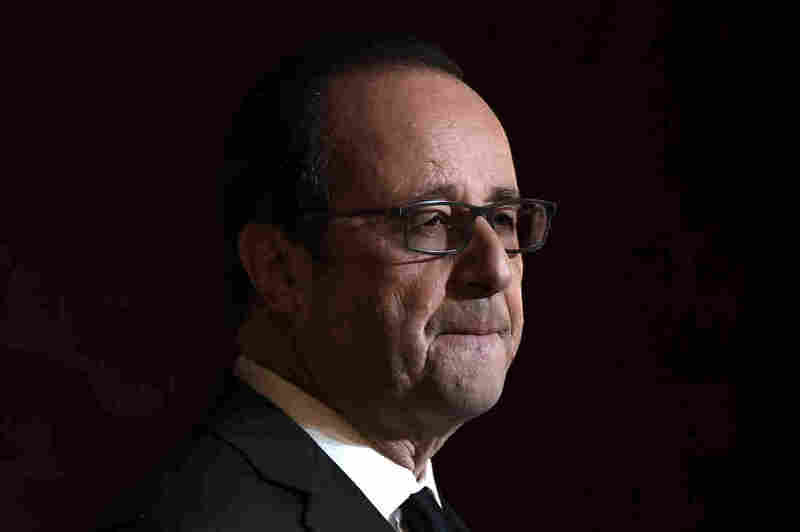 France's embattled president, Francois Hollande, has announced that he will not seek a second term. The surprise announcement from the socialist leader marks the "first time in 60 years that a sitting French president has not run for re-election," as NPR's Eleanor Beardsley reports from Paris. "Terrorist attacks and a sagging economy beset Hollande and made him one of the most unpopular presidents ever." Hollande made the announcement in a televised address, where he spoke for about 10 minutes and defended his record since taking office in 2012, Eleanor adds. "I am aware today of the risk that going down a route that would not gather sufficient support would entail, so I have decided not to be a candidate in the presidential election," Hollande said, according to Reuters. This opens up the candidate field for Hollande's Socialist Party, which is deeply divided, as it prepares for France's presidential election next spring. A few days ago, "Prime Minister Manuel Valls ... said he was 'ready' to compete in the Socialist primary," according to The Associated Press. A former economy minister named Arnaud Montebourg "has already submitted his name," the AFP reports. The eventual candidate will face stiff competition from the right. According to AFP, "voter surveys currently tip rightwing Republicans party candidate Francois Fillon to win the election, with the far-right National Front candidate Marine Le Pen seen as his closest challenger." On the other hand, a recent poll saw Hollande winning just 7 percent of the votes in the first round of the two-stage election. Fillon said after today's announcement that "Hollande had been 'lucid' about what he called 'his clear failure,' " according to Reuters.